I’m calling for a time-out. Whew. I can barely snap my jeans after the exigencies of last week. 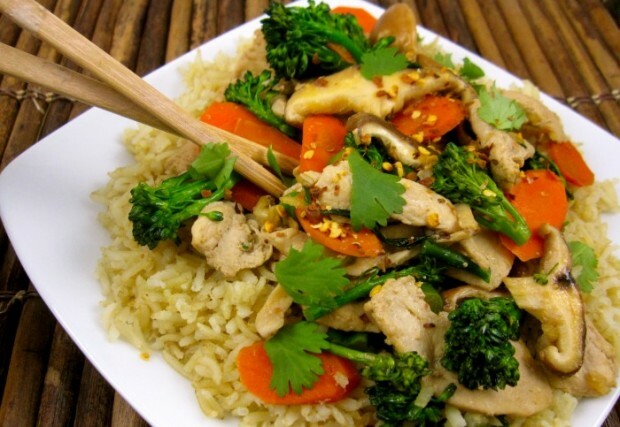 A couple of hours at the gym and a lightened up stir-fry is on the docket for today. This is a recipe drenched in flavor, not fat. 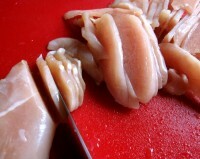 It's a cinch to slice chicken breasts thin when they are partially frozen. It’s also a recipe that can be adapted to any leftovers you may have in your fridge. I have frozen chicken breasts and miscellaneous vegetables. I’m glad the chicken is frozen; I’ll thaw it an hour or so then slice it. It’s far easier to get those paper thin slices of chicken, which cook quickly, when the breasts are slightly frozen. Let chicken marinate as you prepare your ingredients. If ever there were recipes that required you gather your mise en place prior to beginning, stir fries would rank at the top. Let the chicken marinate while you prep your ingredients. I used Trader Joe’s Quick-Cook Organic Brown Basmati Rice. Most brown rice takes a good 45 minutes to cook; this brand is ready in 15 because the rice is par-boiled. I still prefer the bite and flavor of the long cook version, but I turn to this cello bag when I’m in a hurry. To my palate, it’s one of the better quick-cook brown rice options. Whisk together 1 1/2 tablespoons soy sauce, rice wine vinegar and sherry or madeira on a large platter. Let chicken sit in marinade while you prep the remaining ingredients, turning once to coat both sides. Heat 2 tablespoons of the oil to high heat and cook chicken 1-2 minutes per side until just cooked through. Remove and reserve. In same pan, reduce heat to medium high then stir fry broccolini tips, stems and carrots; stir-fry 3-4 minutes. Add remaining soy sauce, shiitakes, garlic and ginger and cook 2 additional minutes, stirring, or until crisp tender. Reduce heat to simmer, and return chicken to pan. Garnish with cilantro and red pepper flakes, if using.